What comes to mind when you find out someone’s working at the same company for 30 years? Loyalty? Dedication? Passion? Uchiide, the international artistic director of Japanese skincare and cosmetic brand shu uemura, possess all these qualities — which have led him to the top of his industry. From Fashion Week to the front covers of magazines, Uchiide’s work has caused been a global sensation. When he’s not working his magic with a brush in hand, he’s developing the next ‘hot’ product that answers to the ever-changing demands of the beauty business. 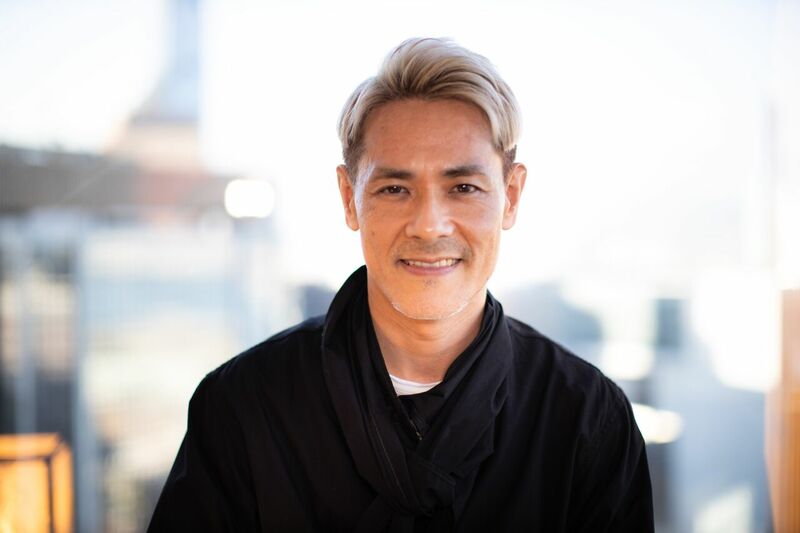 We sat down with the artist to pick up a few tips on perfecting our look, his path to success and the exciting new lipstick launch from shu uemura. When I joined shu uemura, I was a business management law student in university. But I’ve always had a passion for fashion and beauty since I was young, and I dreamed of working in the industry one day. My career in beauty came about by chance when I met Mr. Shu Uemura. I was intrigued by his vision; his goal to capture beauty beyond makeup, in every aspect of his life, really inspired me. I am a big advocate of his ideas and I’ve been working with him since! It’s been over 30 years now! So thanks to him, my dreams are now a reality. If there was a wish-list of who to work for, who would be in your top three? Yohji Yamamoto. I’m a big fan of his, and I have a lot of his clothes! I’ve worked with Karl Lagerfeld in the past, and I’ve always enjoyed collaborating with him. I would love to work with him again. And I have to say I would love to work with young, rising talents from China. I want to support them to push them into the international arena. What’s the best way to prep your skin for makeup? Skincare is very important. Our most iconic product is the cleansing oil. The cleansing oil isn’t just for purifying, it’s fine tuning the skin conditions — that’s really important. To do the makeup, I always start with cleansing oil. After that, the skin needs plenty of hydration, and then seal with emulsion or cream to lock it in. It can be really simple. There’s no need for a lot of complicated steps. The trend in foundation is moving towards a thinner texture. Sometimes we need more coverage, but the trend is going thinner, so skincare is really important. I’ve been using the cleansing oil every day for over 30 years — morning and night. I follow that with lotion, cream and sometimes essence. Even if I’m drunk, I’ll never forget to care for my skin! Depending on the season, I’ll change it to a richer version to accommodate to the weather and climate. What are three hero beauty items that a girl can’t live without. Foundation: The Shu Uemura Lightbulb foundation leaves a beautiful shiny texture to the skin. Lipstick: The RD163 — there are three textures: glossy, semi-matte and matte. I call this “true red”. It’s an essential! And of course, a lip primer so you can enjoy lasting, intense colour. Tell us more about the new RD163. What’s the inspiration behind it? It was a mission for us to discover the ultimate red lipstick. We consider ourselves the experts in Asian beauty. The RD163 was designed to suit any kind of Asian skin tone. This red is a precise balance between warm and cool tones — the benefit of this is that it works with anyone. Looking at the Asian culture, red is probably the most significant colour. For example, in Japan, red is a big part of our identity. We’ve developed this perfect shade in three different textures to create different impressions. What are some tips for taking a day look into night? You can easily add some colour to a day look to transform it to an evening look. A bit of glitter to the eyes works. Also, darkening and extending the eyebrows is nice for the evening. And perhaps a little bit of liquid eyeliner. There are many approaches you can take to change your look easily. What can we look out for in 2019? We’re launching a new foundation this year. All I can tell you at this point is that the texture is to die for! Stay tuned!